Better Way Grand Prize Winner! The “Better Way” and “Why Do We Do That” contest is an important initiative truly rooted in the culture of Venterra with the goals of providing a Better Way of Living for customers and a Better Way of Life for our team members. Gathering ideas and working together to continuously improve our operations is what makes Venterra one of the best companies in the business! In 2013, we had over 600 ideas submitted, 30 total winners, and over $10,000 in cash and prizes won! Winners are selected based on their idea’s overall value to the organization and if they can implemented in one year. At our Annual Kick-Off the New Year Party in Texas, monthly winners selected in 2013 got to “spin the wheel” for a chance to win even more money or a prize! The Grand Prize Winner was also announced and awarded a trip to Las Vegas or $2000! 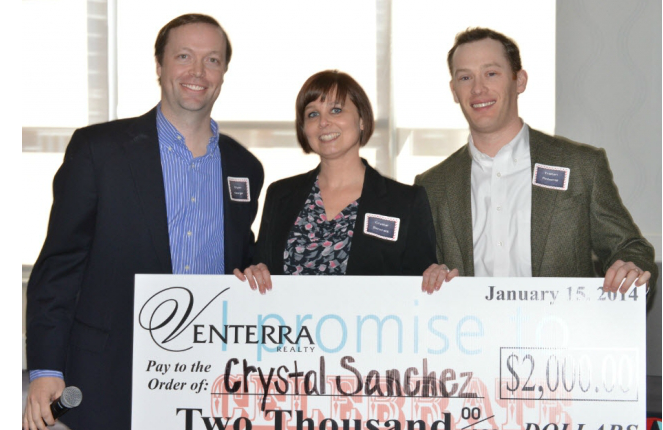 Congrats to Crystal Sanchez, Property Manager at Riverstone Apartments in Fort Worth for your great ideas in helping Venterra be an even better place to live and work!